There is no such thing as out of time, patience is a virtue and there is a right time for everything. Whether due to career change, doing something else, plainly lack of time or plainly to gather forces for the next struggle, a prospect came to a halt and went under wraps for more than fifteen years. Was it worth it? Everything is in the eye of the beholder, and in our case, just like any case where you have to use your ears; everything is in the ear of the listener. The Swedish QUICKSAND DREAM once has been a band in the mid-80s only to shut down in the early 90s, like many examples that couldn’t last that decade. However, eventually it was reformed, but as a duo. Under the cloud of what is rendered as Epic Heavy Metal, the band released a debut named “Aelin” at the starting point of the new millennium. For the newly emerged “Beheading Tyrants” sophomore, the duo took its time, and it was for their benefit. Cruz Del Sur Music, impeccably suitable to release such an epic, issued the album. 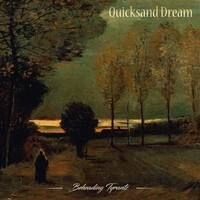 Not exactly stretching in minutes, which isn’t a must for this type of album, QUICKSAND DREAM are sailing through the waves of the 80s, harboring legends and enchanting stories, and from what it seemed to me, it is each to its own. There isn’t a specific clinging to a certain genre within the sphere of Traditional Metal, yet the atmosphere within the songs is quite identical, keeping a straight line from start to end. I liked the harmonious vocals sung by Göran Jacobson, and the sort of storyline structure of the songs, quite an artistic form. Unlike the long length doomy epics, “Beheading Tyrants” is rather simple album to comprehend, and it has its way without bludgeoning heaviness to come and caress, not letting the listener to doze in his/her place. In overall, there is a certain mixture, accompanied by guitar melodies, which some appeared to be somewhat improvised while indicating a sort of an indecision, a share of the British movement along with a conjuration of vibes crossing America and Europe. Such efforts as “White Flames on Black Water”, “To Kill Beneath the Sun” and “The Girl from the Island” are showing that there is a certain diversity within the epic ranks. These won’t necessarily garner that much of a sing-along, yet it is evident that those share an artistic nature. Unlike such icons as HEAVY LOAD, MANILLA ROAD or CIRITH UNGOL, I believe that QUICKSAND DREAM are putting a lesser weight on the music in order to capture the ones that heed their tunes. Sure that there are elements of 80s BLACK SABBATH and some of the above mentioned bands, but “Beheading Tyrants” atmospheric value shows a smoother, clearer, or lighter, picture in the mist that is usually a part of any Epic or Doom Metal album. “Beheading Tyrants” cannot be the band’s strongest effort. It shows tremendous promise and let’s hope it wouldn’t take a decade and a half to come up with the next release.